Wire-on-tube type heat exchanges which has prob- ably been the most widely used condenser in small re- frigerant system for many years consists of tube bundles in which a heat transfer medium such as refrigerant is forced to ¯ow, while a second heat transfer ¯uid like air is directed across the tubes. 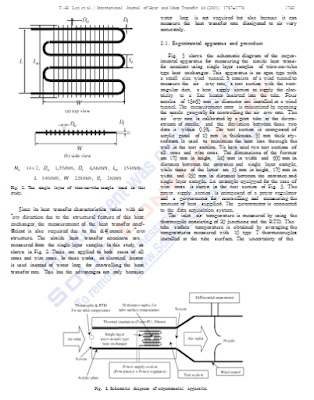 Since the airside thermal resistance of this heat exchanger is much higher than that of refrigerant side, enhanced surfaces such as wires straightly welded on the series of tubes are employed to e€ectively reduce the resistance as in the other ®nned tube heat exchangers, as shown in Fig. 1. Although these are widely used in home refrigerator on accounts of low cost and easy making, the general design data and cor- relation for the airside heat transfer coecient are not easily available. This seems to be so because more studies have focused on the research area such as cycle matching and frosting.